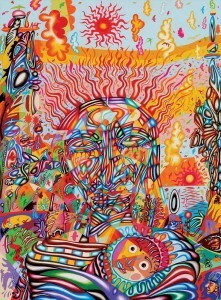 Frank Big Bear's "Mother of Fire/Sun of Water," 2007, color pencil on paper. Big Bear is a largely self-taught Native American artist who utilizes a style in which imagery suggests the collapsing of time and space, depicting historical events and dreams as coincidental on the picture plane. Big Bear’s intensely colored, densely illustrated color pencil drawings pull no punches about the joys and sorrows of a contemporary urban Indian’s path. With inspiration from his White Earth Reservation childhood in Minnesota, American history and contemporary urban life, Big Bear’s works consist of writhing layers of images, complex and fractured surfaces, and pop- and comic-oriented designs. He credits Minnesota-born Ojibwe abstract painter George Morrison, with whom he studied, for encouragement and inspiration. Drawings by Frank Big Bear is organized by the Tweed Museum of Art, University of Minnesota Duluth. The exhibit is presented in collaboration with the Purdue Native American Education and Cultural Center. Purdue Galleries will host a reception for the artist at 5:30 p.m. March 10 in Stewart Center Gallery. Big Bear will make comments about his work in the gallery beginning at 6 pm. Continuing through May 27, the Robert L. Ringel Gallery in Purdue Memorial Union presents “Body in Mind: Selections from the Permanent Collection.” This exhibit features representations of the human figure, which seem to spawn from or live within the human psyche. Included are faces masked in surreal displays as well as bodies comprising odd materials or incorporated into mystical and suggestive environments; everything points to figures staged in dream states or in wistful imaginings beyond our daily reality. Selections from the Permanent Collection are displayed through the support of the Robert L. and Estelle Ringel Gallery Fund, established by the Ringels and supplemented with continued gifts by their friends and associates.